Everyone is pretty sure they are going to die. Billy, feeling both guilty for starting this all in the first place, and extra useless for giving his powers to Loki, decides to blow his brains out with one of Noh-Varr’s guns; if Billy dies, the spell is broken, he figures it’s the only option they’ve got. Except that Loki hasn’t totally bailed! He’s just arguing with himself over what needs to be done. See, apparently, Adult Loki died, but was reincarnated as Kid Loki. Kid Loki tried to do right, but then a ghostie Adult Loki came back, killed Kid Loki’s soul, and took over his body. So, evil Adult Loki is currently possessing the body of sweet and innocent Kid Loki, and he feels kinda bad about the whole thing. Maybe that’s why he jumps back just in time to save Billy and the rest of the team? Anyway, the group neutralizes Mother (for now…) and zips away to recover. Loki explains that Mother is connected to them, now, and can reincarnate any of their dead parents if they are near where they died/were buried. So, the team is forced to become a team and go on the lam to try to work out a more permanent solution to the whole Mother problem. Kieron Gillen, you cheeky monkey, I didn’t even realize these last five issues have been all about getting the band back together. It’s cool, at least Miss America didn’t realize it, either. I think the reason the team-building exercise sneaked up on me is the layers of relationships Killen has built in to this first arc. The team is built in 3 couples, with Billy and Teddy at the middle of it all. Their relationship is at the core of the conflict that created the team in the first place, and Billy’s insecurities are at the core of that core. He’s afraid of his power, and afraid that he’s not good enough for it. On top of that anxiety, he’s got the weight of his responsibility for this problem they’re facing, and the pain of telling his parents that he’s not coming home. Incidentally, that sort of puts him on the same level as the rest of the team; now they’re all missing their parents. The next couple is Loki and Miss America, and they are the most confusing to me. I’ll be honest, I don’t totally understand what Loki has got going on right now, despite the super helpful rundown we got from Loki’s conscience. Hopefully someone out there with more Marvel knowledge can help me understand what’s going on here. We had two versions of Loki, Kid and Adult; Adult has taken over, and he’s definitely bad, but being a kid is forcing him to be good? I can understand how when Loki was reincarnated as Kid Loki he would want to try to do right: fresh start, and all that. But why does Adult-Loki-in-Kid-Loki’s body feel that same desire? I’m also intrigued by Miss America’s decision to stick around. Superficially, I understand; she doesn’t trust Loki and is going to stick around to keep an eye on him, that makes sense. But why does she care about the team at all? 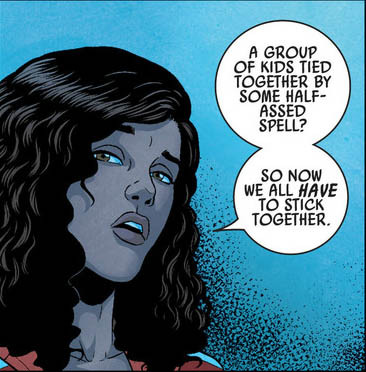 She got on board the Young Avengers train by keeping an eye on Billy, but why was she doing so in the first place? Finally, we’ve got Kate and Noh-Varr. Kate is sticking around because she wants to help her friends, plus there’s the threat of her mother potentially showing up. Noh-Varr is sticking around because a) he’s a good person and wants to help Kate and her friends, and b) my favorite reason for doing anything, “hot make outs.” A gentle reminder that we are reading a book about teens. Gillen has a great handle on keeping the story appropriate for the age of the characters while acknowledging that sometimes that makes for silly circumstances. When Noh-Varr tells us his ship is powered by Kirby Imagination Engines, that it runs on belief, my first inclination was to roll my eyes. That’s kind of cheesy, right? But before my eyes were fully rolled, Kate steps in with a snarky comment about the power of “teenage delusions.” Noh-Varr responds with complete sincerity, “Don’t say that…because we’ll crash.” It’s a literal manifestation of the teenager’s idealistic belief that they can do anything, that just believing in something is enough to make it real. We jaded adults approaching our 30s roll our eyes not because it’s cheesy, but because the world has unfortunately shown us that just believing is not enough, that it was never enough. 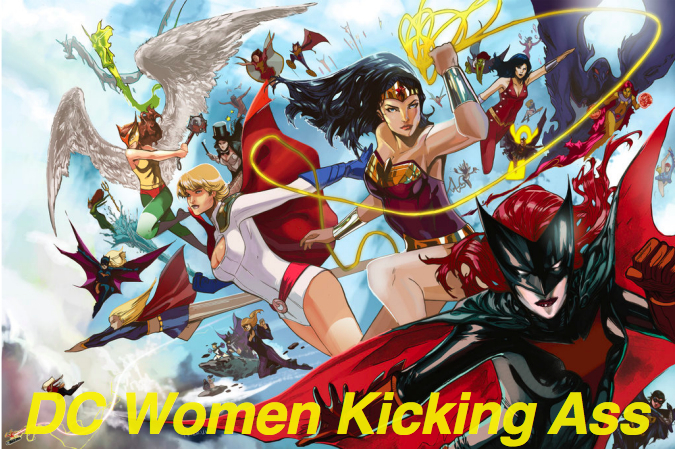 Killen gives us a moment where it is, and that is actually something pretty special. On that shining note, I’m going to turn things over to Ethan. How do you feel about the conclusion to this first arc? Do you have a clearer idea of what’s going on with Loki? I didn’t even get a chance to talk about Jamie McKelvie’s predictably beautiful art, did you completely love it? Ethan: First, McKelvie’s & Norton’s art is decidedly wonderful. 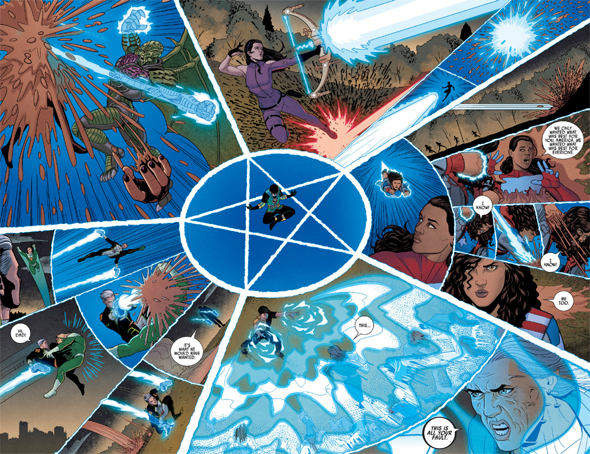 When the team is working together, amped up by Loki’s spell, the fight scene is conveyed almost entirely by this spread. With Loki as the central power source, we see the four most dangerous super-parents taken out while Billy provides general cover for Loki from the zombie-like hordes of adults that have flooded into Central Park. So McKelvie can do fight scenes, we knew that (cf. the tremendously fun, quirky, and acrobatic like Noh-Varr’s club scene in the previous issue). Another thing I love about the art is the focus on the character’s expressions. Comics are an in-between art form: trying to tell the standard written and illustrated story, but with the illustration actually showing the constantly unfolding narrative rather than symbolic tableaus. Not the easiest thing to do. One of the bits that always seems to be the trickiest is capturing the faces of the characters as they both speak and emote. This issue showcases some really great examples in this field. When Ghost-Loki leans in close to whisper “No, it doesn’t,” the expressions are so well rendered. The guilty conscience version of him is making a point that in the midst of all the levity that is par for the course of being a god of mischief, some things are bigger than the joke you wrap them in. And even with only a partial three-quarters shot of his other, embodied, self, we see some surprise, some caution, some anger. I really do not know how you fit so much into so few lines, but wow, this title has been minting a new standard of excellence for distilled humanity in the art, in my book. The starfield is a nice touch – an impression of extreme depth, like a glimpse into the infinite potential of Wiccan’s reality-shaping powers. As Billy dons this new look, I can’t help but see it as a symbol of him donning the mantle of leadership of the team. We’ve already seen him giving orders and directing tactics, even though they’re all still figuring out this superhero thing. With Billy at the center/helm of things, it’s an interesting role reversal. In the earliest Young Avengers issues, we had Patriot (the Captain America figure) calling the shots, while Asgardian (Billy in the Thor role) was more of a bit player. Now Billy is growing into the space of taking responsibility for the team’s direction while Miss America (Captain-America-meets-Captain-Marvel) takes more of a secondary spot. But where Steve Rogers almost always exudes an aura of calm, deliberate sense of purpose and confidence in his own leadership, Billy almost blows his own head off in a misguided interpretation of his responsibility. Self-sacrifice is one thing, but Billy obviously has a lot to learn about how to hold it all together on a personal level while you’re steering the ship. All told, we’ve got a very fertile foundation for this new team and I can’t wait to see where it goes. Finally, yes, we’ve got the crazy loose cannon factor and comic relief provided by Loki. 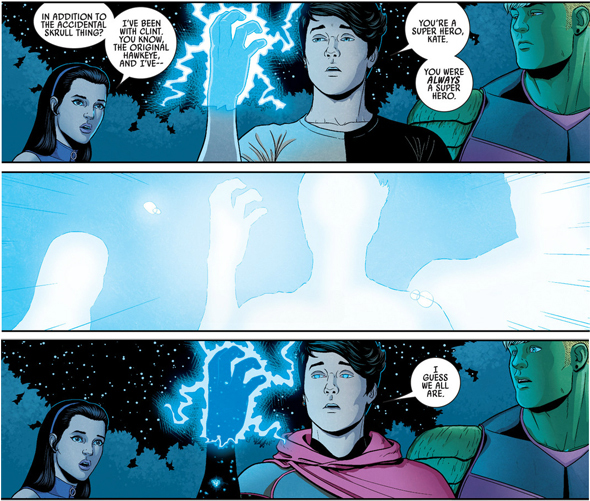 While he’s very occasionally showed up on teams before (always of the supervillain variety, of course) his presence on the Young Avengers squad is a tenuous one. He has experience and power, but the former is mostly in screwing things up for everyone and the latter is stunted by his new, teenage form. Sometimes superhero teams have a dark side, like the incredibly dangerous and unpredictable character of the Void bound up in the Sentry’s psyche, or like Darkhawk on the Excelsior team (aka the Loners), or even like the X-Men’s Wolverine, who never hesitates to strike off on his own to deal some bloody justice. But as Loki himself points out, he’s more of a god than a human part of a superhero team, and he’s a god with a very conflicted history. So now, with some of the most powerful and whimsical parts of himself bound up into the lesser, younger version of himself, he’s both a huge liability and a potentially solid member of the team, like all of the dark heroes that have come before. But with WAY more of the liability. Also, because this issue marks the end of the first arc, I have to say I can’t wait for the next chapter. The parent-hypnotizing spell that held this arc together has been a fun and bizarre ingredient, but the more the story leaned on it as a core component, the more it started to irk me. Like the zombie-president arc in Deadpool – hilarious idea at the beginning, but maybe didn’t really have legs for the long-run. As you say, Shelby, Gillen has done a great job assembling the team, and I am psyched to see them start tackling new crises together. I’m so glad I got into this book! I’m really loving this title. This is what I hoped Teen Titan would be and what I hope the Green Team will become. Also, as someone who is brand new to Marvel (only read Hawkeye) I have found this a really easy book to get into. More Kid Loki please! So in YA we have a ship that runs on Teenage Delusions..METAPHOR!!! and in the Green Team we were introduced to a Car that runs on Social Media. All crazy ideas right? A car that runs on Facebook? So the whole storyline with Kid Loki happened in Kieron Gillen’s run on “Journey Into Mystery.” Loki died and was reincarnated as a child. This Kid Loki didn’t want to grow up to become a villain again, so he tried to do good. Eventually he succeeded for good, and became a definitive good person, praised for his good deeds in Asgard and beyond. Only, like Loki mentions in this issue, it’s not sticking. Being in the body of the “hero” Kid Loki is muffling Adult Loki’s ambitions. 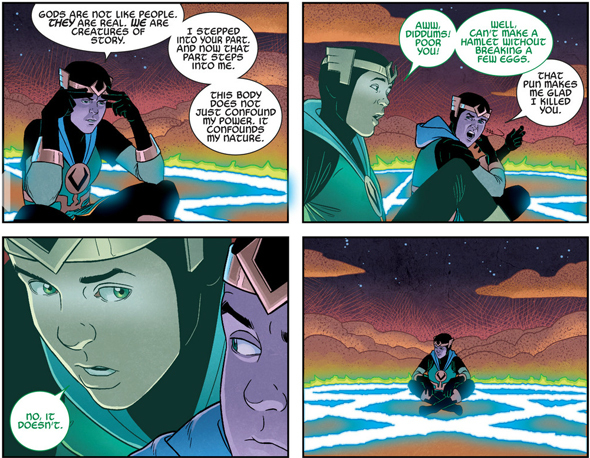 This isn’t because being a child is automatically making Loki a better person; it’s like Loki says in the picture above, the Gods are creatures of story, and when Adult Loki stepped into the body of the “heroic, praised hero Kid Loki”, he started to take on some of his more noble nature as an aftereffect. In that effect, Loki runs off belief almost in the same way that Noh-Varr’s Kirby Engines do. That is interesting and complicated in a way that I really like. That was a great history of Kid Loki! THANKS!!! Really, everyone should read Gillen’s Journey into Mystery. It’s absolutely amazing, even as it gets bogged down in crossovers. Of course, this spoils the absolutely tragic finale, but still. Great read. How did I miss this post? Very well done. I picked up the first two issues then dropped it because I found the storyline disappointing. But I’m seriously thinking about picking this up again.